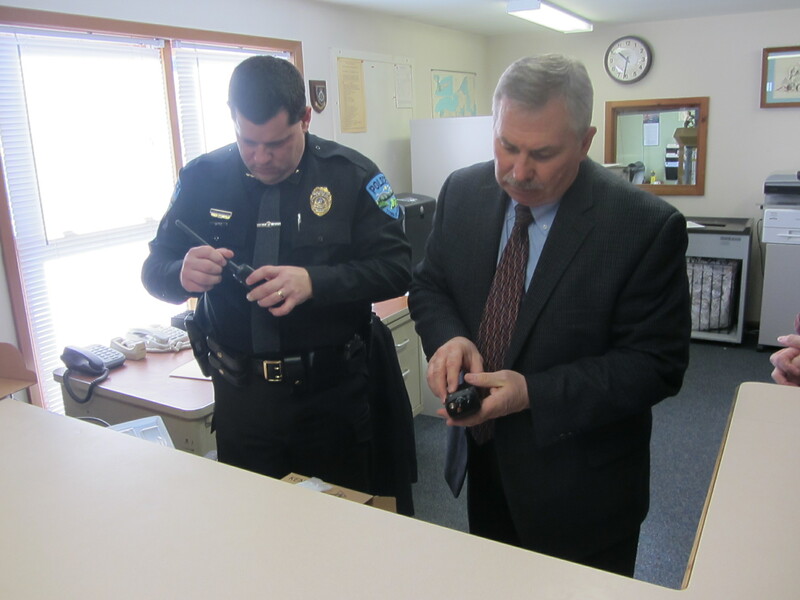 The Town of Webb Police Department received some new communications equipment on Tuesday, January 20, to upgrade its local law enforcement operation. The equipment consisted of radios and wireless routers. They were presented to the Town by Herkimer County Sheriff Chris Farber at the Webb police station. The purchase was made with grant monies from the federal Department of Homeland Security. Farber said a yearly assessment determines the needs of police departments within the county. “We see what will benefit the police department the most,” he said. The grant, that had been applied for in 2014, provided Webb with Project 25 (P25) radios. The P25 radios allow for complete inter-operability across the state, and cost about $1,100, Farber said. “We used to buy radios for around $300, but when you’re purchasing through Homeland Security, there are certain guidelines you have to follow,” he said in explaining the need for the advanced equipment. “One of the guidelines is…that they have to be P25 [models]. They’re a much better radio, and we have had pretty good luck with them,” he said. The Police Department was also given MiFi wireless routers for the police vehicles to send data back and forth to the station. MiFi is a brand of wireless router that acts as a mobile Wi-Fi hotspot. “It’s put right into the laptops in the vehicles,” Farber said. Town of Webb Police Chief Ron Johnston said the routers will add some nice capabilities to the department’s patrol fleet. “Basically, MiFi gives us access to the internet for everything we do in our cars [from] writing tickets, accident reports and everything else,” he said. 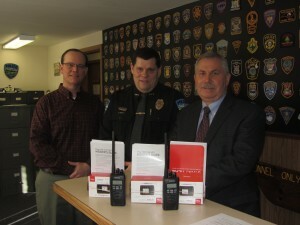 Without MiFi, patrolmen must drive back and forth from the station in logging law enforcement complaints. So, the upgrades will allow for significant time savings, according to Johnston. “We can keep the cars on the road longer. That’s the most important part of our jobs—what we do in our cars,” he said. Sheriff Farber said the county is seeing less and less grant funding as the years go on. At the start, nearly $56,000 was received. Last year, the amount was down to $16,000, he said. “Our goal is to work together and stretch the funding as far as we can between each agency,” he said. Farber mentioned that MiFi seems to be what the agencies are looking toward, for obvious reasons. The increased efficiency they provide also helps in reducing local budgets. The County Sheriff’s Depart-ment is interested in doing anything it can to help out, he said. Town of Webb Supervisor Ted Riehle thanked the Sheriff for the interagency cooperation. “These are issues that he brought forward, and I can’t thank him enough,” he said. “We appreciate the equipment and we will put it to good use,” Johnston added. Written by: Gina Greco on January 22, 2015. Last revised by: Gina Greco, our reviewer, on January 29, 2015. This entry was posted in admin and tagged Herkimer County Sheriff, new equipment, Town of Webb Police on January 22, 2015 by Gina Greco.